Enter the serial number for your Mac below and press submit. You can find your serial number on a sticker on your Mac, or by going Apple Menu > About This Mac, then clicking the More Info button. This brings up System Profiler, and on the Hardware Overview that is displayed by default you should see your serial number, and be able to copy/paste it. You can also locate your Mac from its Model Identifier with our Model ID picker. Alternatively, you can select your Mac from the choices below. Please use this page to help locate your particular Macintosh computer. We have included a picture and description of every Mac we support on this page, for further information on any machine please click on its image. This will take you to a dedicated page for that Mac, which includes more information on how to distinguish it from similar models, as well as a complete list of compatible upgrade products. Throughout the site you can also use the top navigation to go directly to the specific page for any Mac. The Mac Pro Late 2013 has a cylindrical case design and is totally unique. These Mac Pros looks very similar to the PowerMac G5s and to the earlier Mac Pros. The easiest way to tell the Mac Pros from the G5s is to open System Profiler and check the CPU type (will be Intel Xeon for a Mac Pro). To distinguish between differnt Mac Pro models, open System Profiler and go to the memory section and check the memory speed. For the 2009 and later models it will be either DDR3 1066MHz or DDR3 1333MHz. These Mac Pro looks very similar to the PowerMac G5s and to the later Mac Pro 2009/2010 models. The easiest way to tell the Mac Pros from the G5s is to open System Profiler and check the CPU type (will be Intel Xeon for a Mac Pro). To distinguish between differnt Mac Pro models, open System Profiler and go to the memory section and check the memory speed. These early models will have DDR2 667MHz or DDR2 800MHz. This PowerMac came in the same case as the earlier single-core PowerMac G5s and the Mac Pros. This machine is best distinguished from the earlier PowerMac G5s by the fact that it has 2 x RJ-45 Ethernet ports, earlier machines had 1. Mac Pros also have dual ethernet ports but also has 2 optical drive bays, while this PowerMac G5 only has 1. This PowerMac came in the same case as the later dual-core PowerMac G5s. This machine is best distinguished from the later PowerMac G5 and the Mac Pro by the fact that it only has 1 RJ-45 Ethernet port, later machines had 2. The PowerMac G4 FireWire 800 has a very similar case, and the same twin CD bays, as the Dual Optical. Its main distinguishing features is the presence of FireWire 800 ports, as opposed to FireWire 400 on the earlier machine. The PowerMac G4 Dual Optical was the first G4 PowerMac to accept a second optical drives, as opposed to a Zip drive. The distinctive four air intakes on the front of the machine are only present on this machine, and the later FW 800 model. The PowerMac G4 Quicksilver 2002 was released late 2001/early 2002. This machine has the same distinctive silver case as the first Quicksilver, without the four front-panel air intakes of the 167MHz bus machines. The 2002 version of the Quicksilver was released in single 800MHz and 933MHz, and dual 1GHz configurations. 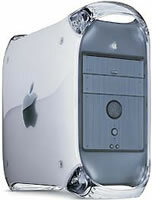 The PowerMac G4 Quicksilver was the first PowerMac to come in the silver case that Apple used for the later G4 PowerMacs. Unlike the 167MHz bus machines it doesn't have four air intakes on the front panel. The case is identical to the Quicksilver 2002. However this earlier Quicksilver was released in single 733MHz and 867MHz, and dual 800MHz configurations. The PowerMac G4 Digital Audio was released in 466MHz, 533MHz, 667MHz, 733MHz and dual 533MHz configurations. It was the last G4 produced in the older graphite case. The Digital Audio was the only graphite PowerMac sold with these specific clock speeds - however there was a 733MHz Quicksilver. The G4 Cube was a unique take on the PowerMac G4. Housed in an 8"x8"x10" cube, the G4 Cube was a fully-functional PowerMac, but with the styling of Apple's consumer level machines. This page is for any dual processor PowerMacs in both the AGP Graphics and Gigabit Ethernet ranges. The single processor AGP Graphics and Gigabit Ethernet PowerMacs were released in 350MHz, 400MHz, 450MHz and 500MHz configurations. The case is the standard graphite of the early G4 PowerMacs. The PowerMac G4 PCI Graphics (right) was also released in 350MHz and 400MHz configurations. One way to distinguish between the two models is to check the audio ports on the rear panel - on the AGP Graphics/Gigabit Ethernet machines these will be aligned vertically. The PowerMac G4 PCI Graphics was released in 350MHz and 400MHz configurations, in the same graphite case as the rest of the early G4 PowerMacs. The AGP Graphics was also released in 350MHz and 400MHz configurations. A method of distinguishing between them is to check the audio ports on the rear panel. On the PCI Graphics the ports will be aligned horizontally. Be sure to check your processor speed too, since the Digital Audio also has horizontally aligned audio ports. The PowerMac G3 Blue & White came in a similarly designed case to the later PowerMac G4s - styled plastic with four carry handles and a hinged side door. However the blue and white colouring is unique to this machine and positively identify it. This was Apple's last machine in a Beige tower case. It should say PowerMac G3 on the front, to distinguish it from earlier PowerMac towers. Be aware however that a few Rev.A PowerMac G3s were also sold in a tower case, although only direct from the Apple Store. To determine if you have a Rev.A, check the ROM revision with the Apple System Profiler utility. A ROM revision of: $77D.40F2 means a Rev.A machine. This was Apple's last machine in a Beige desktop case. It should say PowerMac G3 on the front, to distinguish it from earlier PowerMac desktops. This machine is externally identical to most Rev.A Beige G3 desktops. This page refers exclusively to later revisions of the G3 Beige. This machine should be labeled PowerMac G3, to distinguish it from earlier PowerMacs. Although most Rev.A Beige G3s come in the pictured desktop case, the Apple Store did sell a few Rev.A towers directly, which had the same case as the later Beige G3 towers (far-left). The PowerMac 8500, 8600, 9500 and 9600 are all in tower cases - although they do vary slightly between the different ranges. All machines should be identified on the front of the case, if this is missing please see the detailed machine page for more information on distinguishing them from other PowerMac towers. These pre-G3 Desktops all use the same form factor case, however they are all marked clearly with their model number. if this is missing, identification should be done with the Apple System Profiler software installed on the machine, as	they differ only	very	slightly internally. The PowerMac 7200 is a desktop, the 8200 (pictured here) is in a tower case. Both machines should be labeled with their model number on the front of the case. Should this be missing, please see the detailed machine page for more information on distinguishing them from other machines. The PowerMac 6100 (pictured), 7100 and 8100 came in a pizza box, desktop and tower case respectively. These PowerMacs use Nubus expansion slots, as opposed to PCI on later PowerMacs. All of these machines should be labeled with their model number on the front of the case, should this be missing, please see the detailed machine page for more information on distinguishing them from other machines. The MacBook Air ultraportable was released in early 2008. Initially with a 13" screen, with an 11" model introduced later. The machines are much thinner than other Apple laptops, and do not have an internal DVD drive. The MacBook Aluminium released in October 2008 has a 13.3" screen and an Aluminium case similar to the MacBook Pros. In June 2009 this machine was updated and renamed the MacBook Pro 13" - upgades for these two machines are very similar and we deal with them on the same page. Can be distinguised from the earlier MacBooks by the radically different case, and from the MacBook Pros by screen size or System Profiler. The black version of the MacBook (shown) is very distinctive. However the white version is reasonably similar to the Dual USB iBooks. You should check the CPU type in System Profile - the MacBook has an Intel Core Duo or Core 2 Duo processor. The MacBook Pros also use Intel Core Duo/Core 2 Duo, but have larger screens and are silver in colour. The 13" MacBook Pro with the very high resolution Retina display. No optical drive, non-upgradeable RAM and a non-standard SSD drive. The 15" MacBook Pro with the very high resolution Retina display. No optical drive, non-upgradeable RAM and a non-standard SSD drive. An updated version of the MacBook Aluminium. Very similar apart from a larger RAM capacity and the addition of a FireWire 800 port an SD card slot on this model. This link will take you to the same page as the MacBook Aluminium link. This MacBook Pro is a 15" Unibody laptop that looks similar to the 2006-2008 model. To distinguish between this and the older model below, check the keyboard colour. The Unibody model has a black keyboard, earlier models have a silver one. This MacBook Pro is a 17" Unibody laptop that looks similar to the 2006-2008 model. This MacBook Pro is a 15" 2006-08 laptop that looks similar to the 15" PowerBook G4 Aluminium and the MacBook Pro 15" Unibody. The best way to distinguish between MacBook Pros and PowerBooks is to check System Profiler for the CPU type, which will be an Intel type for this machine. To distinguish between this and the above Unibody model, check the keyboard colour. This earlier model has a silver keyboard, the Unibody machines have a black one. This MacBook Pro is a 17" laptop that looks similar to the 17" PowerBook G4 Aluminium and to the MacBook Pro 17" Unibody. The best way to distinguish between MacBook Pros and PowerBooks is to check System Profiler for the CPU type, which will be an Intel type for this machine. See the full machine page for more details. The PowerBook G4 12" Aluminium covers the entire range of Apple's 12" G4 PowerBooks. The PowerBook G4 15" Aluminium was the second range of 15" PowerBook G4s. The 15" Titaniums look fairly similar, but they have a black keyboard, not the silver of the Aluminium. The MacBook Pro also looks similar. The Aluminium was produced in configurations of 1GHz and upwards, the earlier Titaniums also had a 1GHz model, but nothing higher. The MacBook Pro uses an Intel processor. The PowerBook G4 17" Aluminium covers the entire range of Apple's 17" G4 PowerBooks. The 17" look fairly similar, but have an Intel processor rather than a PowerPC G4 one. This was Apple's first G4 PowerBook range, and its titanium finish and 15" screen distinguish it from all earlier Apple laptops. The later 15" Aluminium PowerBook G4 looks fairly similar, but has a silver keyboard as opposed to the black one of the Titanium. This PowerBook was released with clock speeds up to and including 1GHz, the 15" Aluminiums were 1GHz and upwards. The PowerBook G3 Pismo - aka the PowerBook FireWire - was the last of the G3 PowerBooks. It has a very similar case to the PowerBook G3 Lombard, with the same 14" screen and bronze keyboard. The Pismo was released in 400MHz and 500MHz configurations, the Lombard also has a 400MHz model. The unique attribute of the Pismo in the PowerBook G3 range is the FireWire port on the back, which replaced the SCSI port on the Lombard. The PowerBook G3 Lombard has a translucent-bronze keyboard, which distinguishes it from earlier PowerBooks. The case is almost identical to the subsequent PowerBook Pismo. The Lombard was released in 333MHz and 400MHz configurations, the Pismo was released at 400MHz and 500MHz. The Lombard has a USB port (first PowerBook to do so), but unlike the Pismo it has an HDI30 SCSI port as opposed to FireWire on the later machine. The PowerBook G3 Wallstreet was the first black PowerBook - earlier machines had been a charcoal colour. The Wallstreet is all black, including the keyboard. There is a multi-coloured Apple logo above the keyboard. The Wallstreet has the Apple legacy SCSI and Mac Serial connections, and does not have either USB or FireWire. The iBook G4 is in the same case as the iBook G3 Dual USB, and is also available in 12" and 14" configurations. The white MacBook is reasonably similar but uses an Intel Core Duo CPU, rather than a PowerPC G4. See this page for any iBook with a G4 processor. The iBook G3 Dual USB was a very long-running and hugely popular Apple laptop. The case was a major change from the Clamshell iBooks. The model took its name from its twin USB ports. The white iBook case is shared with the G4 iBook, and the easiest way to differentiate these machines is to check the processor type. This second version of the Clamshell iBook came in 366MHz and 466MHz configurations. The case is the same curvy design as the first iBook, but it was sold in different colours. There were two 366MHz models, the first was graphite in colour, the second was available in indigo and lime green. The 466MHz version was graphite. The first 366MHz model had a USB port but no FireWire, the latter models had both a USB and a FireWire port. This first version of the Clamshell iBook introduced the very distinctive curvy case which became an icon. The original version was released at 300MHz. It came in blueberry and orange colouring, and the plastic used was fairly translucent when compared with the later Clamshells (left). This model of the iBook had a single USB port but no FireWire. These slim Unibody iMacs were introduced in Late 2012. They differ from the earlier models by their thinner screen that tapers to 5mm at its thinnest point. This Aluminium iMac is clearly distinguished from the earlier model by the different coloured case. This page covers iMacs made from Mid 2007 until the 2011 revision (which was sold until Late 2012). It is somewhat similar to to the slim Unibody models introduced in Late 2012, but those machines have a much thinner screen that tapers to 5mm thickness at its thinnest point. The easiest way to distinguish between them is to open System Profiler and see the CPU type. This machine uses an Intel processor. This, the last in the PowerPC based iMacs, uses the G5 processor. All the parts of the computer are built into the flat-screen, making this machine easilly distinguishable from earlier iMacs. The machine does look very similar to the White Intel iMacs, and you should check the CPU type. This machine uses a PowerPC G5 processor. The G4 based Apple iMac is completely unique. It has a flat-panel monitor mounted on a domed base. The Apple eMac is somewhat similar to the G3 iMacs in that both are computers built into CRT monitors. The eMacs are all white, and they have a 17" screen, rather than the 15" screen on the G3 iMacs. This second major revision of the G3 iMac was a very long-running machine, and came in a wide variety of colours. Like the previous G3 iMacs these are an all-in-one design based on a 15" CRT - there is also a 17" CRT based machine called the eMac. The distinguishing feature of these machines compared to the older G3 iMacs, is that these machines have a slot-loading CD drive - the CD is inserted into a slot on the front of a the machine, with no ejectable CD tray. The original G3 iMacs were a revolution in computer design, a colourful all-in-one unit based around a 15" CRT monitor. These machines can be distinguished from the eMac by the 15" CRT on the iMac compared to the 17" on the eMac. To tell the difference between these and the later iMacs is the CD unit. These earlier machines have a standard tray-loading CD drive, with the later iMacs CDs are inserted into a slot. This early Intel based Mac minis look very similar to the G4 Mac mini. The easiest way to tell the difference is to check the CPU type. Later models have a much slimmer case design. This first Mac mini was the smallest Mac ever made when it was released. It looks very similar to the Intel based Mac mini and you should check the CPU type to distinguish between them.